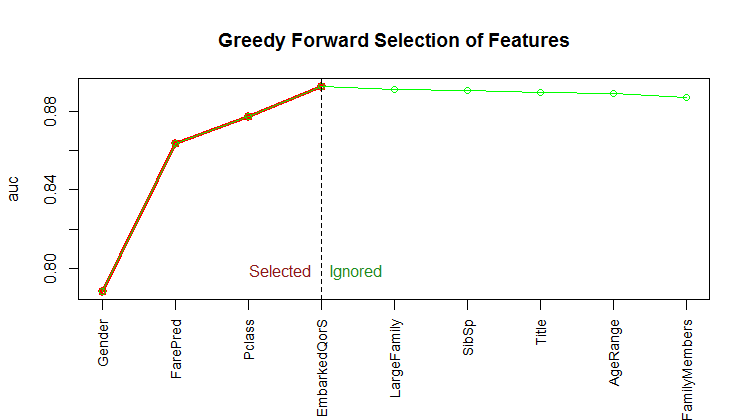 Select features using a basic greedy algorithm. 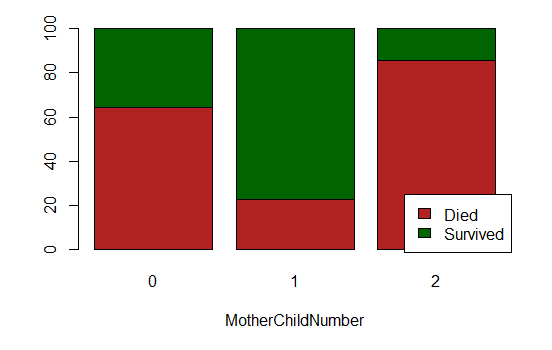 Use the randomForest algorithm in R.
Perform a simplistic grid search for finding adequate hyper parameters. We do not pretend to give an optimal solution3. Machine learning is still very trial-and-error oriented and there is a plethora of ways that could be tried to enhance the results. There are numerous parameters that could be tuned, and current approaches resemble a form or another of a greedy algorithm (as trying all possible combination of parameters—and features—is currently intractable). Several columns are categorical data. Tree based algorithms (such as random forest or gradient boosting machine) can usually handle those columns without problems. By contrast, other popular algorithms, such as generalized linear models or neural networks (dubbed “deep learning” nowadays) would require converting those columns to numerical (e.g., one-hot, enum or binary encoding offer possibilities to achieve this). We can observe that the columns Age, Fare, Cabin and Embarked have some missing values. While the missing values for both Age and Cabin are consistent between the train and test sets (roughly 20% and 80% of missing values, respectively), there is only one missing Fare value in the test set and two missing Embarked values in the train set. Remember that all manipulations made on the training set must be done on any subsequent data set for which we need to predict the outcome. Here, we have the data set X we use for crafting the machine, we have Xt for which we want to predict the outcome (i.e., the Survived column). In this section we only present the features from which we derive non-trivial new features (e.g., we do not mention features for which we just performed minor changes; see the source code for the full details). We can observe that the chances of survival when the cabin is known are higher. Perhaps because survivors could tell their room afterwards? 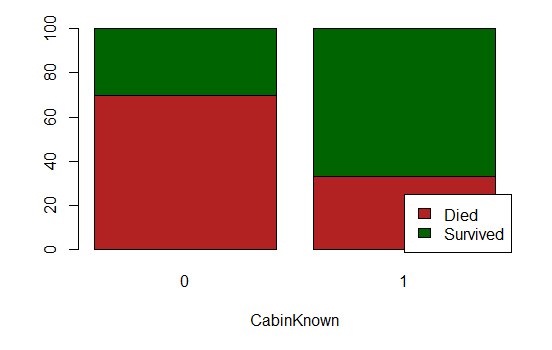 We add the new feature CabinKnown and drop the column Cabin (there is nearly 80% of missing values, data imputation techniques might yield rather poor outcomes). It appears that only two passengers embarked from unknown location (in the train set, and none of them in the test set). Those two passengers are two first-class women that survived, but it seems they have the same ticket number, the same cabin and the same fare (X[X$Embarked == "", ]). Those coincidences are rather weird; it might very well be an error in the data. Even though the data set is small, and we already crave for more data, those two rows are overly suspicious; and thus we decide to remove them (X <- X[-which(X$Embarked == ""), ]). Besides, we can observe two categories: The ones that embarked at Q and S have approximately the same chances of survival, which is noticeably less than the ones that embarked in C. We add the new feature EmbarkedQorS. The feature Ticket seems to follow several conventions. All of them have a number, though. We extract that number and create a new feature TicketNum (and drop the Ticket column). There seem to be some outliers in those numbers. We replace those outliers with the median of the ticket numbers found in the train set (median imputation). That is very basic/naive, and we might revise this decision later on. finally, “Master” and all passengers aged below 10 are “Child”. 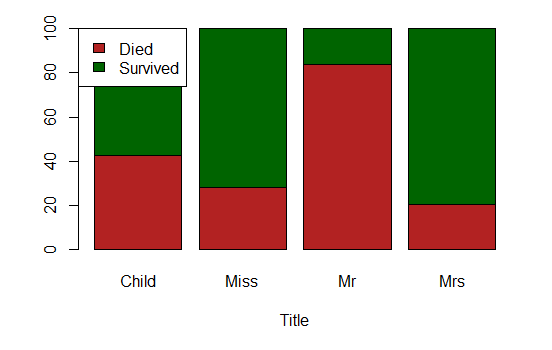 It appears that “Miss” and “Mrs” have more or less the same chances of survival. We add a new feature Gender that aggregates them (the name might not be the best one…). Gender and Title might be redundant. Ultimately, the features selection algorithm will pick. Note that we named the three levels of the categorical feature Gender, “1”, “2” and “3”. It does not matters, as the columns is categorical and not numerical. 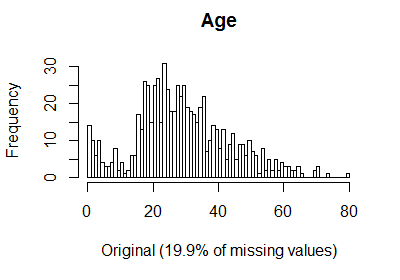 There are a non-negligible number of missing ages (about 20%). This feature seems quite important. 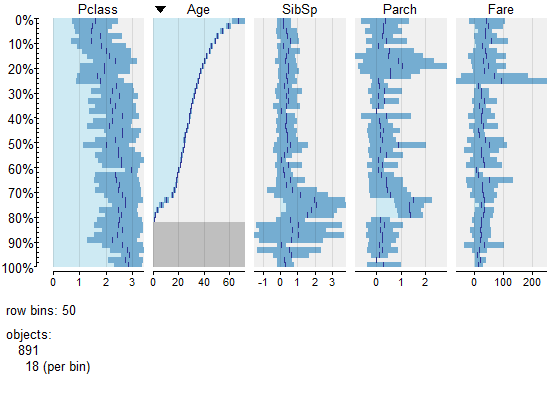 We use data imputation to estimate the missing ages; specifically, we rely on a k-nearest neighbour imputation—other techniques could be tried, such as, e.g., imputations via bagging (see the caret package) or generalized low rank models (Udell, Horn, Zadeh, Boyd, & others, 2016). Those techniques could be regarded as—actually, they are—unsupervised learning techniques. We need to be careful not to use the test set for any preprocessing4 (data imputation is performed for the test set as well, but by using preprocessing from the train set only). We add the new feature AgePred and drop the original one Age. 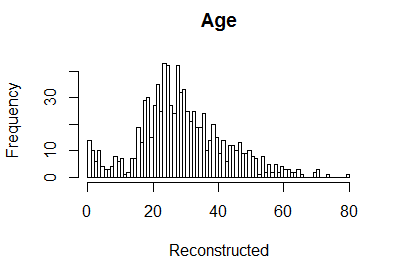 The missing Fare value in the test set is imputed using the same technique as for the missing ages imputation described above. We add the new feature FarePred and drop the original one Fare. A validation set is extracted from the train set. 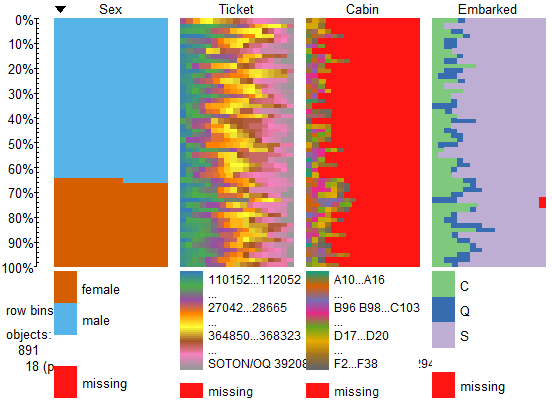 We need a validation set (i) to assess the performance of subsets of fatures during the feature selection step, and subsequently, (ii) to select the best models out of the grid search. One can remark that we use different proportions for (i) and (ii)—0.5 and 0.8, respectively. The rational for it lies in the fact that we do not want to pick features that are prone to overfitting (hence a larger validation set). However, a larger validation set comes at the expense of training data; so much that the resulting train set might not suffice (hence a smaller validation set during grid search). We implement a forward stepwise algorithm (greedy algorithm), that does not guarantee the optimal subset of features, but that should yield a subset that performs well. To assess the performance of subsets, our implementation supports accuracy (acc), mean square error (mse), logloss and AUC (area under the ROC curve). 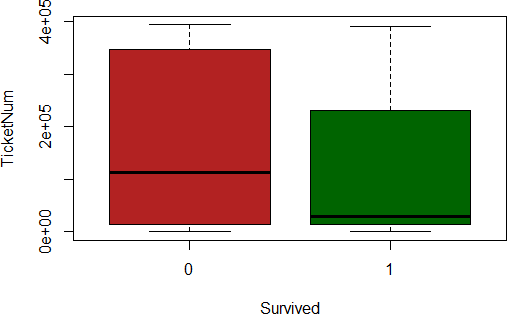 We used AUC, because it is threshold independent and is a good metric provided that the classes to predict are not overly unbalanced (here, we have roughly 38% of survivors). Quite surprisingly, only four features were selected: Gender, FarePred, Pclass and EmbarkedQorS. We perform a simplistic grid search (Cartesian) to find adequate hyper parameters. Here is the sorted grid result—first decreasingly by validAcc, then increasingly by oob (we show only the “head”). © 2017 Loic Merckel, Apache v2 licensed. The source code is available on both Kaggle and GitHub. Udell, M., Horn, C., Zadeh, R., Boyd, S., & others. (2016). Generalized low rank models. Foundations and Trends in Machine Learning, 9(1), 1–118.